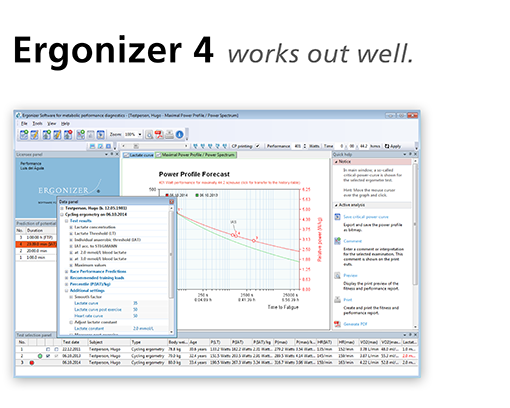 Ergonizer is a highly innovative computer software for scientific exercise testing, training prescription, interpretation, and performance prediction. With Ergonizer, you are able create sophisticated, automated reports about physical fitness from laboratory or field exercise testing data. Since more than 20 years the software has been improved and extended step-by-step and offers user-friendliness and information gathering from exercise tests. Basic application of Ergonizer is the graphical interpretation and user-independent, robust analysis of blood lactate measurements during exercise. Who is using ERGONIZER commercially? 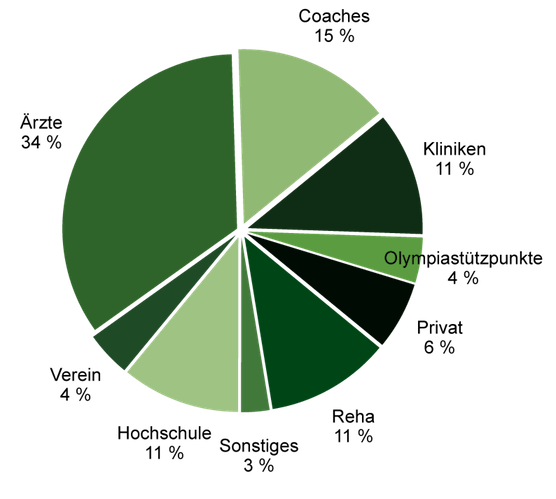 is reliable, profound, versatile, objective, exact, and engineered in Germany. we offer a tool that comes from the scientific coaching of professional athletes and performance diagnostics in the medical context. 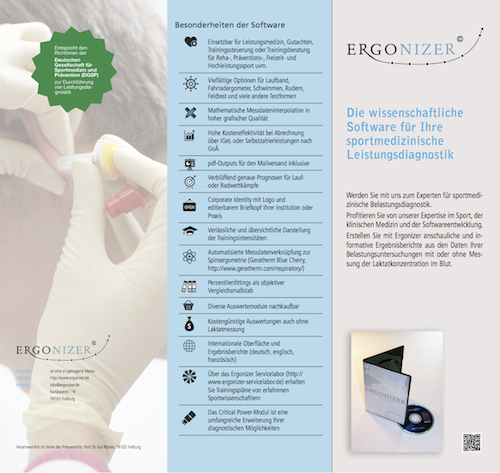 That means, Ergonizer not only contains all proved standards for the evaluation of physical fitness beyond breath gas analysis - much more, Ergonizer is highly optimized for usability and robustness. What is your maximal bicycle performance for 5 minutes? Or for 10, or 13.4, of for 2 hours? How long do you cycle 220 Watts? How fast can you run 2 Miles? Are you a sprinter or a long distance whiz? How's your functional threshold power (FTP)? The well-known Critical-Power-concept of Monod & Scherrer (1965) describes the relationship between maximum performance to the related exercise duration. 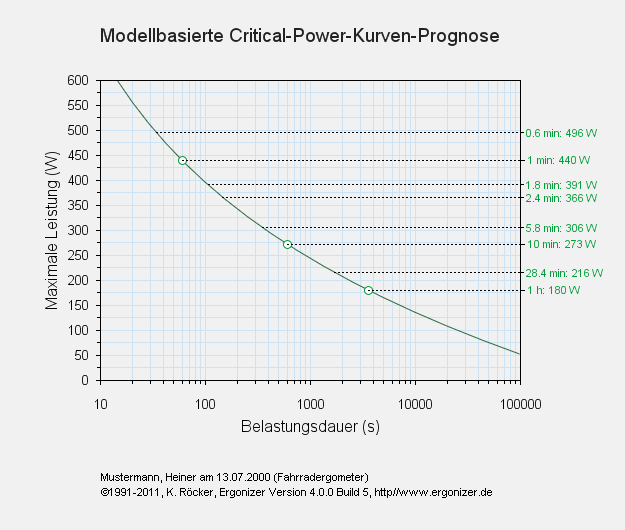 Contrary to that concept, Ergonizer Software calculates interactive Critical-Power-curves from regular exercise tests without any additional effort! For each freely chosen duration, you get the related maximum performance and vice versa interactively. 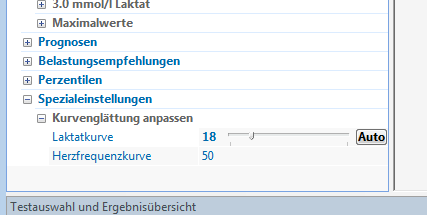 E.g., with Ergonizer Software, it is really easy to calculate, how far a subject could run for 12:00 minutes. Or for 42.195 meters. This works for running tests on the treadmill as on the bicycle ergometer and for many other types of ergometries. This information might be worthful for the control of high-intensive interval training (HIT) or to analyze specific changes in performance from one to another test. And best of all, these Maximal-Power-Profiles will be calculated from one single, regular exercise test (multistage test protocol with blood lactate measurements). All updates can be downloaded without additional costs during the "Grace Period" of 1 year after purchase. 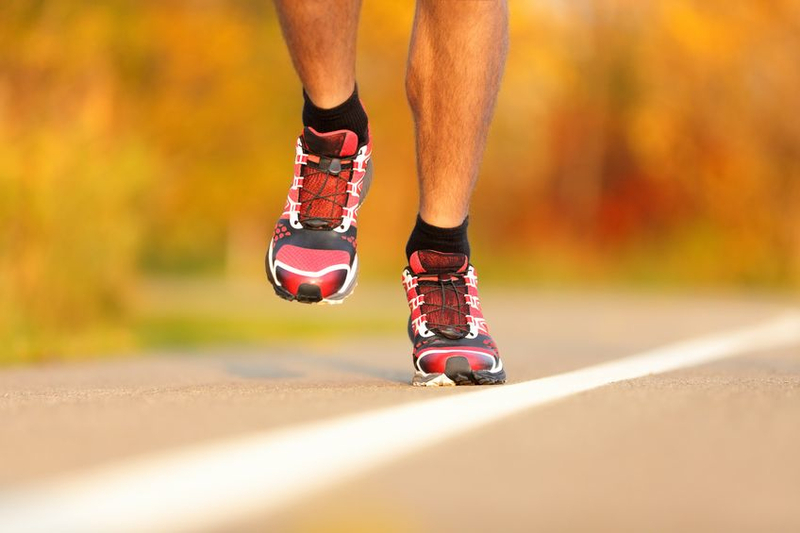 Do you know all determining factors if using heart-rate to guide your endurance training? Curve fitting for heart-rate and lactate in Ergonizer is based on evaluated algorithms. In some rare cases, a manual adjustment of the automated smoothing function is required. Therefore, interactive manual alignment of the smoothing factors is now implemented to the software.